Jack Guiney is back with his club Rathnure after struggling with a knee problem during the league. WEXFORD WILL HEAD into battle in the Leinster SHC without the services of forward Jack Guiney, who has left Davy Fitzgerald’s squad. 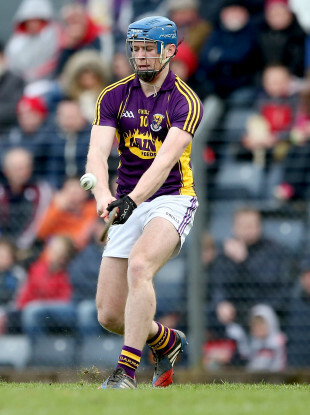 It was reported earlier this week that Guiney had been dropped for disciplinary reasons, but Wexford coach Seoirse Bulfin said the Rathnure clubman’s departure was due to his injury struggles. “Jack at the moment is obviously gone off the panel because he struggled with an injury right throughout the league,” said Bulfin at the launch of the Leinster SHC today. Guiney struggled with a knee problem throughout the league. He appeared off the bench in the opening rounds of Division 1A against Waterford and Cork but missed the remainder of the competition due to a cartilage problem. There were fears he would have to go under the knife but Guiney managed to avoid surgery on his knee. Guiney lined out with his club in the Wexford club championship against Naomh Eanna last weekend, scoring 1-5 from placed balls in an impressive display at centre-back. Email “Wexford confirm talented forward is no longer part of Davy Fitzgerald's panel”. Feedback on “Wexford confirm talented forward is no longer part of Davy Fitzgerald's panel”.